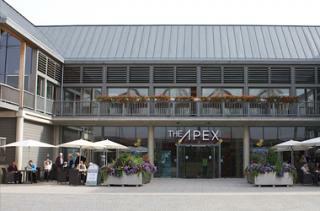 Frigg went down a storm at The Apex on their last visit to The Apex. They’re back on 29 March, and with five successful albums, a folk music ‘Album of the Year’ nomination and ‘Top of the World’ features in Songlines magazine, Frigg have firmly established themselves as the leading act on the Nordic scene. Featuring the premier talents of a young generation of folk musicians, Frigg has developed their own blend of Nordic folk and American bluegrass; an energetic, heart-bursting blizzard of jigs, reels and traditional tunes. Named after the Norse goddess of love and fertility, the innovative young combo features the virtuosic talents of three members of the famed Jarvela family from the central Finland village of the same name - siblings Alina and Esko Jarvela and their cousin Antti are the family’s fourth generation of famous fiddlers. “This Helsinki septet manages to sound like a polka band, a rock group, or a Riverdance ensemble, while remaining purely acoustic and firmly string-powered.” - Alex Monaghan, Folkworld. Drawing first and foremost on the folk music heritage of their homeland, their fjord and forest-imbued Nordic tunes are peppered with innovative infusions of world music styles, from Celtic to Balkan and Americana, making for a truly distinctive, irrepressible and life-affirming sound. The band will also hold a Finnish Fiddle Tunes Workshop for all string players at 5pm the same day; Scandinavian tunes - jigs, reels, polkas, schottisches and waltzes - will be taught by ear, but with scores available for future reference. Frigg will be at The Apex on Wednesday 29 March at 7.30pm. Tickets are £16, ring the Box Office on 01284 758000, or visit www.theapex.co.uk for more information, or to book your tickets. National Car and Vehicle hire company.